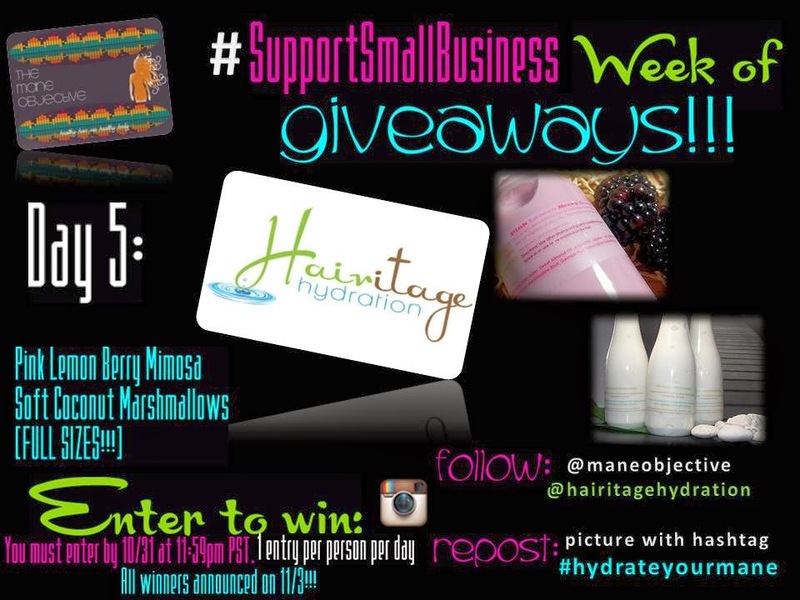 The Mane Objective: #SupportSmallBusiness Week of Giveaways Day 5: Hairitage Hydration! 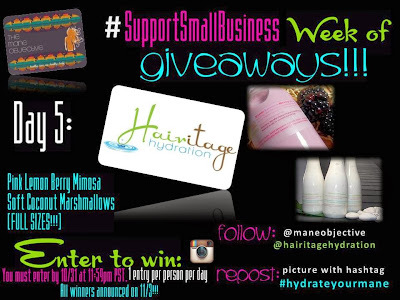 #SupportSmallBusiness Week of Giveaways Day 5: Hairitage Hydration! In case you missed the opportunity to enter Day 4 and win Shescentit goodies on Facebook, you can get on the good foot with Day 5! After today, there's only 2 DAYS LEFT!!! Hairitage Hydration is giving away a Pink Lemon Berry Mimosa and Soft Coconut Marshmallows-- BOTH FULL SIZES! Now enter -- you've got until 11:59pm PST TODAY (10/31) to enter to win :) All participants can only enter once per day, and all winners will be announced on November 3rd. Thats right - November 3rd. It was the 1st, but two more AMAZING small business brands signed on to the giveaway - stretching this thing on out to a FULL 7 DAYS!